Thanksgiving Week! 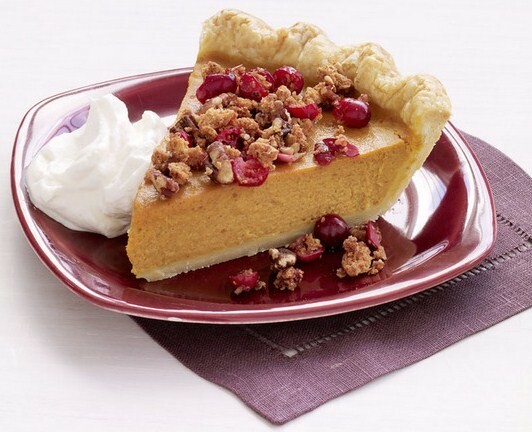 It’s desert time – Pumpkin Pie! It is not Thanksgiving unless you have pumpkin pie for desert. But don’t think that you can only make this desert for Thanksgiving – you can make it all throughout the fall/winter (and even in the summer if you used canned pumpkin!). It’s a great all around desert, even though we normally associate it with the holidays. I have a long history with pumpkin pie, as I wrote about in this post. What I love is the silky creaminess of this pie, which is incredibly light, while being satisfying. The crunch really puts it over the top and adds some much needed contrast of texture. Dried cranberries, pecans, and amaretti cookies are all great accents to the pumpkin pie which help elevate it into something special. Served with whipped cream or even a dollop of Greek yogurt, this is the best pumpkin pie you’ll ever eat! Make the pastry: combine the flour, sugar, and salt in a large mixing bowl. Add the butter and mix with a pastry blender or your hands until the mixture resembles coarse crumbs. Pour in the ice water and work it in to bind the dough until it holds together without being too wet or sticky. Squeeze a small amount together, if it is crumbly, add more ice water, 1 teaspoon at a time. Form the dough into a ball, wrap it in plastic wrap, and refrigerate it for at least 30 minutes. Sprinkle the counter and a rolling pin lightly with flour. Roll the dough out into a 10-inch circle. Carefully roll the dough up onto the pin and lay it inside a 9-inch pie pan. Press the dough firmly into the bottom and sides so it fits tightly. Trim the excess dough around the rim and pinch the edges to form a border. Place thecrust on a sheet pan to catch any spills. Refrigerate until ready to fill. Filling: Puree the pumpkin in a food processor with the butter and a pinch of salt. Measure 1 1/2 cups puree into a bowl. In another bowl beat the eggs and sugar until the sugar has melted. Add the eggs to the pumpkin puree and whisk well. Add the cream, cinnamon, and nutmeg and stir well to combine. Pour the mixture into the pie shell, and place on the bottom rack of the oven. Brush the pastry with the beaten egg white. Lower the oven temperature to 325 degrees F and bake until the pie is set but still jiggles slightly, about 40 minutes. Remove from the oven and allow it to cool. Meanwhile, put the pecans on a baking sheet and bake them with the pie for about 10 minutes to toast them. Remove them from the oven and let them cool. Thaw the cranberries in a strainer set over a bowl to catch the liquid. Put the cookies, pecans, and cranberries into a food processor and pulse them a few times until they are coarsely chopped. Sprinkle the topping evenly over the cooled pie and serve immediately. Enjoy this pie! If I were you, I would make two of them – it gets eaten pretty quick! this will never compare to the one i made.